The pre-Christmas sale of a major stake in Blue Rubicon is further proof that the PR industry is becoming increasingly attractive for private equity investors. PRWeek's 2012 Consultancy of the Year sold a majority stake to private equity investor LDC in mid-December, in a deal that valued the business at about £30m. The transaction comes off the back of recent private equity investment into College Group, MHP owner Engine Group, Karmarama and its offshoot PR venture Kaper and investor relations business Investis. While both blue Blue Rubicon and College Group were understood to have held discussions with trade buyers before selling stakes to LDC and Vitruvian Partners respectively, it is thought that both agencies preference was for non-trade investment. One key factor that has made this an increasingly viable route for raising capital is the evolution in the nature of the comms industry in recent years. 'Digital and social media have fundamentally changed the way investors feel about PR,' said Jim Houghton, partner at Results International, which worked on the LDC/Blue Rubicon deal. Another driver of interest in the sector is the changing nature of private equity investment itself since the financial downturn - away from highly leveraged, short-term investment and towards longer-term, growth-orientated partnerships. Private Equity investments in UK marcoms have not always gone according to plan. ECI Partners lost around £10m when digital media agency i-level collapsed into administration in 2010 and VSS Mezzanine Partners and ABRY Senior Equity invested heavily in Speed Communications-owner Loewy Group as it ran up losses of £35m before being bought by Writtle Holdings. However, largely these firms used a debt-funded acquisition model to engender rapid growth - a model that the private equity industry has had to move on from since the financial downturn. Fraser Hardie, senior partner and founder of Blue Rubicon, said this longer-term growth blueprint benefited the agencies themselves by not imposing on them the restrictions of quarterly reporting. Charles Watson, group chairman of Karmarama and former FD CEO, noted that high-level consultancy and the advisory nature of modern comms businesses made them attractive to PE investment, but 'there are very few businesses of any scale in the sector'. Houghton agreed that PE would generally only be interested in directly investing in businesses making annual profits of £1m with staff numbers of around 100. But while there are few independents left in the UK with this scale, Houghton suggested that PE investment may underpin an increase in general agency M&A. He said those agencies that had received 'flagship investment' would have the funding to make other deals happen, such as College Group's purchase of Merlin last year. One of the most successful examples of private equity investment into PR was Advent International's £23m backing of a Financial Dynamics MBO in 2003. The agency was sold to FTI Consulting for £137m in 2006. College Group sold a majority stake to Vitruvian Partners, valuing the firm at around £45m in October 2011. In June 2011, Charles Watson co-launched a marcoms group and acquired ad agency Karmarama and its offshoot PR firm Kaper, with private equity firm Phoenix Equity Partners backing the deal. Investor relations firm Investis was acquired for £25m in an MBO led by Gresham Private Equity in October 2012. Blue Rubicon, the four-time PRWeek Consultancy of the Year, announced it had sold a 'significant' stake to private equity investor LDC on 14 December. 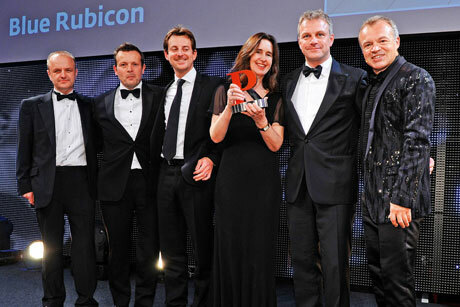 The deal valued Blue Rubicon at about £30m and will underpin the agency's expansion into new markets and territories. Terms of the deal were not revealed, but it is thought LDC has acquired a majority stake in the business. Gordon Tempest-Hay, CEO of Blue Rubicon, said the deal would enable the agency to invest in digital and analytics, and to move into new markets to 'respond to client demand'. Blue Rubicon was founded in 1999 by Hardie, former head of comms at PowerGen, and Chris Jones, former home news editor at Channel 4. Key clients include McDonald's, Coca-Cola, British Gas, Shell, Unilever, GlaxoSmithKline and Facebook.